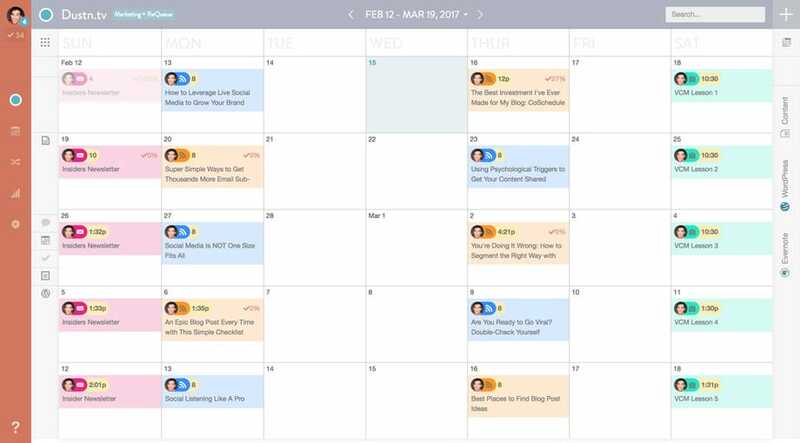 For planning and organizing your blog editorial calendar, CoSchedule might just be your new best friend. Your blog, in and of itself, is a major investment. The time you put into it, the passion that drives it, and the vulnerability of creating something and sharing it with the world are all huge investments. Okay, it’s time to take this blogging thing to the next level. In 2015 I decided that I wanted to take my blogging to the next level. I wanted to get serious about being both consistent and strategic. Knowing that I am a visual person, I knew I needed something to help me with planning and executing my blog strategy. After taking a look at several solutions out there, I discovered CoSchedule. CoSchedule’s marketing calendar gave me everything I was looking for and so much more. I’m convinced that there is no better planning, coordinating, and executing tool out there for bloggers. In this post, I’m going to dive deep into all the features that make it an essential part of my blogging process and why you should seriously give it a look. First of all, I’m a highly visual person. When it comes to planning things out, I need to physically see it. If you’re the same way, you’ll love CoSchedule’s visual calendar interface. It gives you a full-screen layout of your month (or as many weeks as you want to show at a time). With the drag/drop interface, you can take unscheduled drafts from your content drawer and drop them onto your calendar when you want to publish them. As long as you’ve already connected your WordPress site, these drafts will be updated with the date and time that you’ve set in CoSchedule. 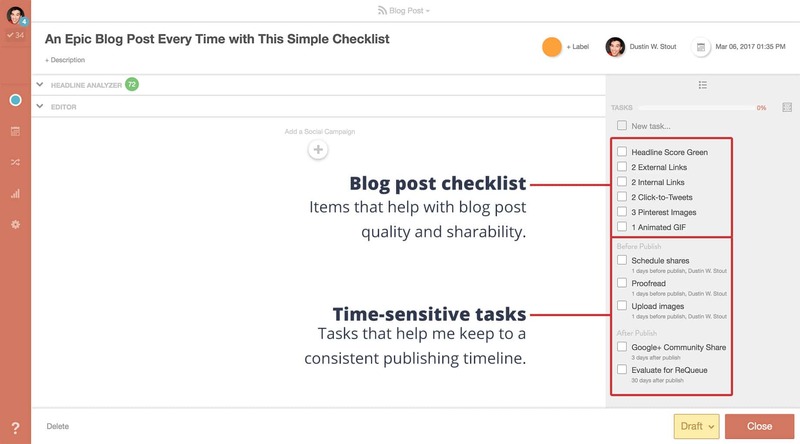 You can also create new content from anywhere on the calendar. If you are creating a blog post, it actually creates the WordPress draft as well. Pretty convenient. This is now how I go about saving ideas for blog posts. If I’ve got a great idea, I add it to the calendar immediately and either put it right on the calendar, or drop it in my content drawer. Another little gem is the ability to color coordinate your posts. What I’ve done is assign each blog post category a color. This way, when I look at my calendar, I can instantly know which categories are getting the most attention and make sure I’m hitting all categories as frequently as I want. Wow, now doesn’t that look super organized?! And there are many more types of “content” you could be publishing as a blogger. Thankfully, CoSchedule allows you to plan them all. They currently have 20 different content types you can add to your calendar. Right now, I’m mostly just using the Blog Post, Newsletter, and Course types for my personal blog as well as the occasional Social Campaign for things that I want to promote using CoSchedule’s Social Templates (more on this later). Task templates make my editorial process so much smoother. Instead of having to reference my “Blog Post Checklist” (coming soon) and “wing it” when it comes to executing the post in time, I have just set up a task template. My primary task template includes what things need to be in the blog post, and what timeline they all need to be done in. Your process may not be as elaborate. For me, this level of discipline is needed to keep me on track. 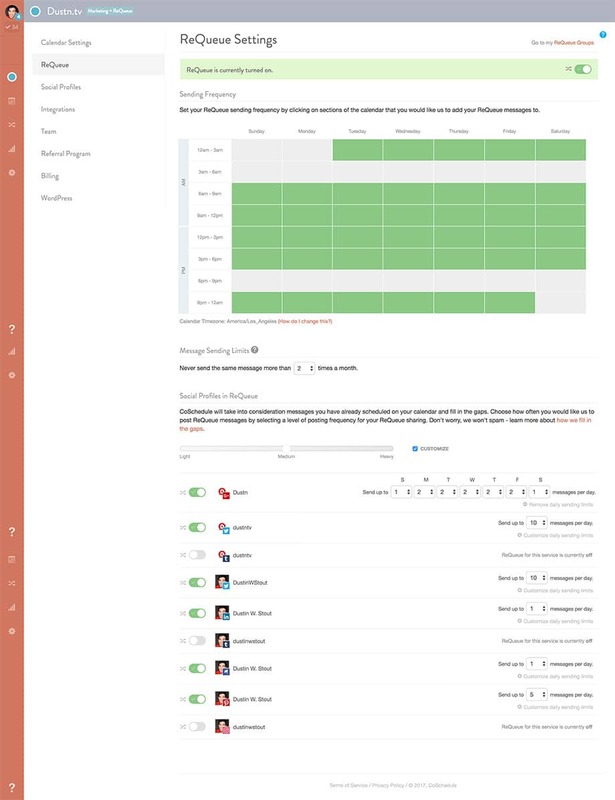 You can customize your own Task Templates however you want. And that’s the real beauty! Your workflow, the way you want it. Social Templates allow you to create a social media promotion schedule that you only need to plan once, but apply to every blog post you publish thereafter. You probably have a routine when it comes to promoting your blog posts once they’re published. Maybe you go and manually share them all to your social networks or maybe you use Buffer to do so. Imagine how long that takes. Every. Single. Time. 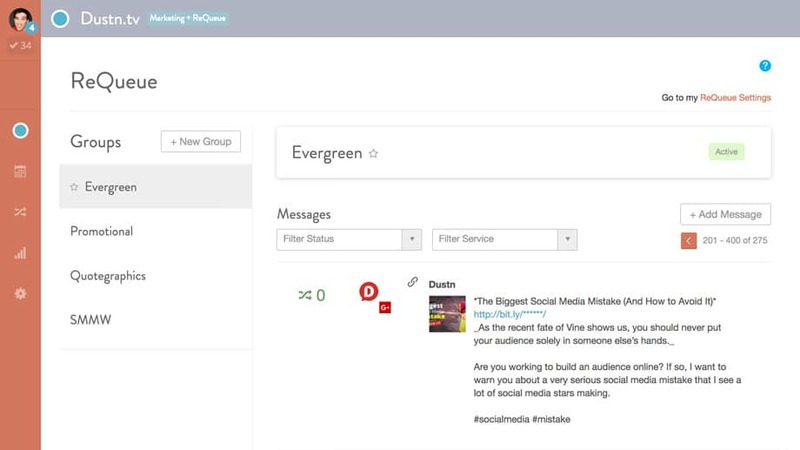 Well, Social Templates allow you to schedule that routine once and with the addition of Text Helpers, Image Helpers, and even Video Helpers you can create placeholders in each social message that you can populate quickly and easily one time. These have literally saved me hundreds of hours of work per year since they released them. Can you see why they alone are worth the price of admission? If Social Templates have saved me hundreds of hours, ReQueue has saved me thousands of hours that I wouldn’t have even considered working in the first place. What ReQueue does is allow you to decide which posts to repromote (ideally your evergreen posts, and then put them on a repromotion schedule completely on auto-pilot. I freaking love this feature. All you need to do is select which of your social posts you want to add to be repromoted and CoSchedule will intelligently decide when is the best time to share them based on frequency and ideal time of day. You can set up your ideal reposting frequency on the settings page. You can also create multiple different groups, each with their own frequency settings. I have yet to find an automated system for evergreen posts that works this well and is this simple to set up. I haven’t yet talked about the ability to connect your social accounts and use CoSchedule as the central hub for all your social sharing. 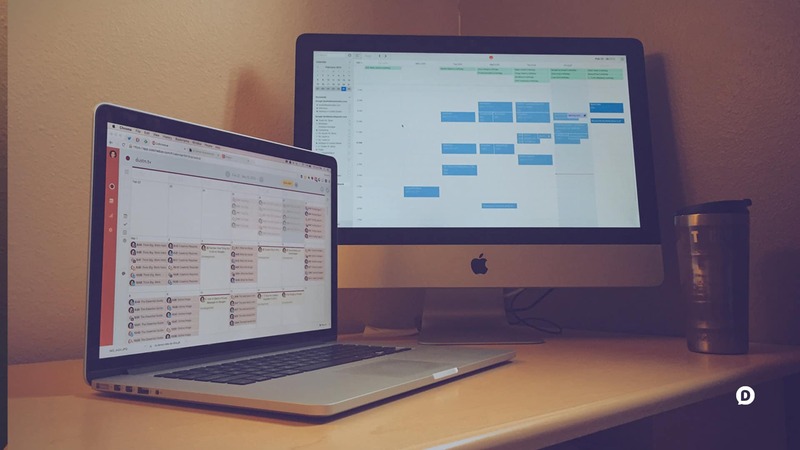 Just like scheduling your blog posts, you can schedule social media posts. In my humble opinion, this is all you need and more. 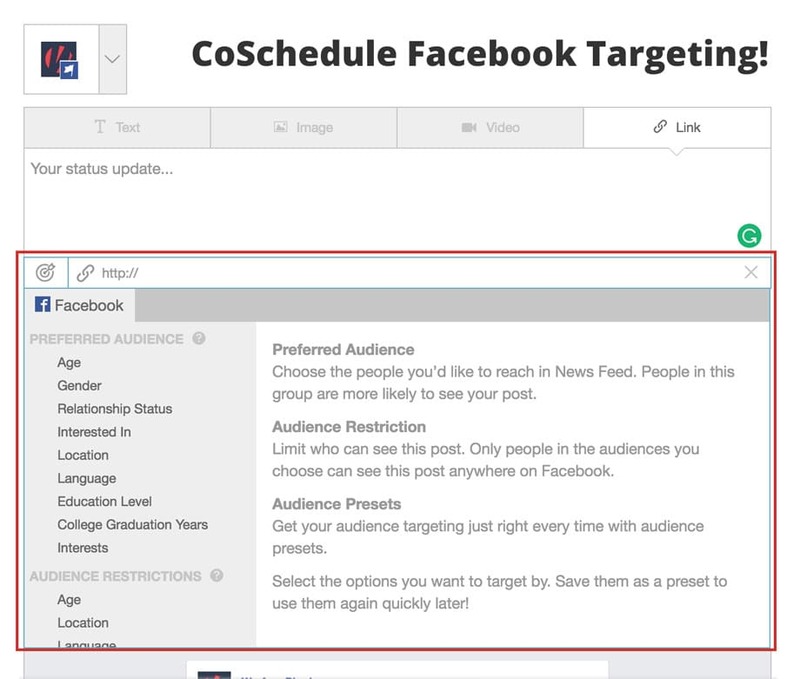 They’ve also just recently announced that you can now target specific audiences with your Facebook posts when using CoSchedule! This is a real game-changer in the Social Media Scheduling space. This is something I’m really looking to try out for our Warfare Plugins calendar. 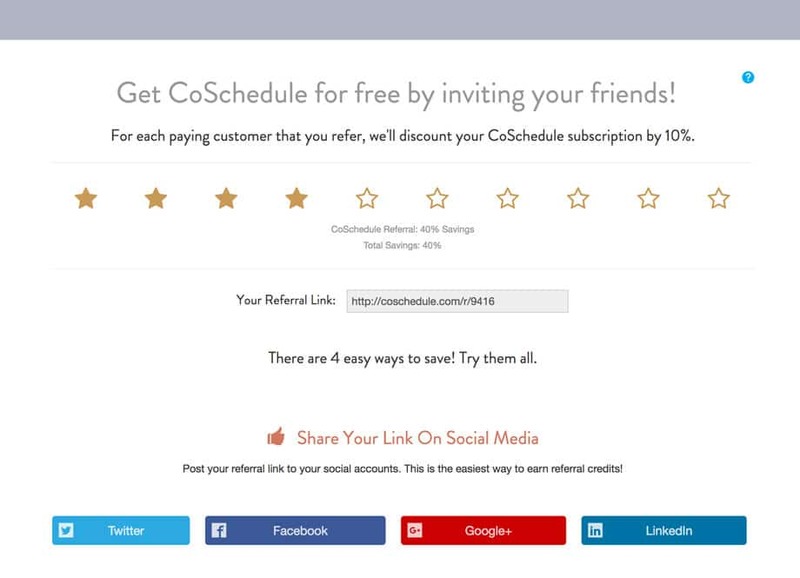 So if you’re like me and you save money whenever or wherever you can, you’ll also love CoSchedule’s referral program. When you sign up for an account you’re given a Referral Link which you can share out. Each time someone clicks on your link and ends up signing up for a paid CoSchedule account of their own, you get 10% off your monthly (or yearly) bill. That means if you were to get 10 paid referrals, you’d get your plan 100% paid for! They also have the option for you to write a review on your own blog and you can submit it to them for an instant (and lifetime) 50% discount! Yes, that’s one reason I’m writing this post. But I would have written it anyway because I blog about the tools and apps I use frequently, and CoSchedule is one of the tools I simply cannot live without. With a 14-day free trial, there’s literally no risk to giving it a try. The amount of time that the Social Templates and ReQueue save me is worth the price alone. There are services out there that perform similar services with far less ease that cost more. The fact that CoSchedule also allows me to visualize, plan and execute on my blogging as well as any other related marketing efforts (like newsletters) is icing on the cake. No, screw that… that’s icing on a cake that is on top of another cake, which also has icing on it. So if you’re a serious blogger who wants to make your life easier, more effective, and more efficient, give CoSchedule a try. How about Hashatory, would you consider something like this for your Instagram brand marketing campaigns? I’m not sure I can trust a company that: 1) misspells their description when I search them in Google, and 2) doesn’t really describe what they do at all on their homepage before displaying their pricing. As a recommendation, I would say to completely avoid Hashatory just based on initial impression. These Instagram tools come and go weekly. Thanks for your insights on the CoSchedule calendar. I am very familiar with CoSchedule as I use their fabulous headline analyzer. I did do the trial for the calendar and it just wasn’t for me. Perhaps I didn’t know all the great features or how to really use the calendar to its full potential. Your post has given me a more positive spin on the calendar so i may go back and try it out again. Those are still the 3 primary things I keep paying for, despite the fact that there is so much more to CoSchedule now. I’ve really been on the fence about whether or not CoSchedule was right for my blog. Thanks for writing this Dustin, I’m definitely going to give it a try. You’re welcome Anna! If you have any questions, don’t hesitate to reach out.